You've heard of Facial Masks but have you ever heard of an Armpit Detox Mask? This may be the most important mask routine you'll ever do! Up to 70% of breast cancer is found in the armpits and upper region of the breast. Our breast tissue is made of vessels, glands, and lymph. Our lymphatic system is responsible for removing toxins and waste from our bodies. 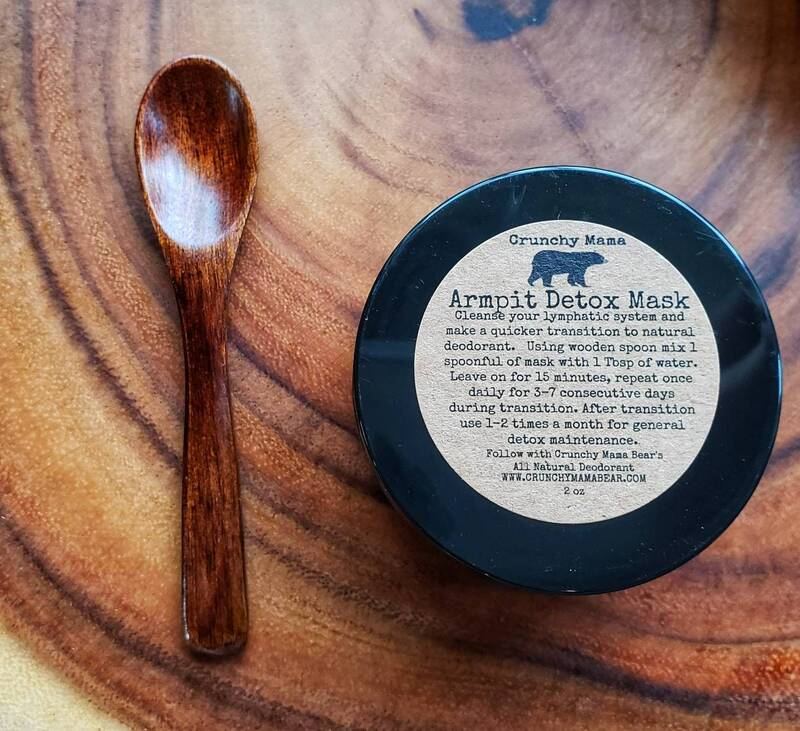 Crunchy Mama Bear's Armpit Detox Mask is something to be used to help the transition from chemical filled aluminum containing deodorant. Many people who try all natural deodorants often complain that they don't work and make them smell worse. It's not that they don't work it's that for as many years as you've been wearing traditional antiperspirant deodorants you've been trapping toxins in your body. Each container will yield approximately 20 masks. For the first week of transition apply once a day for at least a week. Use only the hand carved wooden spoon that's included with purchase (do not use metal) in a bowl mix 2 spoonfuls of powder with a little distilled water to make a paste. Apply to armpits for 10-15 minutes, shower! After masking daily for a week you'll want to use once a week. If you've already transitioned to a natural deodorant use mask once a week for general detox maintenance. Ingredients in Armpit Detox Mask are known to pull toxins and heavy metals from the body! Disclaimer: Product not intended to diagnose, treat, cure, or prevent any disease. It is also good as a facial mask, as the instructions suggests. Super fast shipping! Samples included. That’s what I call amazing customer service! !